Few things in life are as wonderful as people joining together for a good cause. Add music to the mix and this only elevates things further. Each year, university choirs from around South Africa convene at the Kuesta University Choral Festival, which celebrates artistic excellence through world-class performances and workshops. 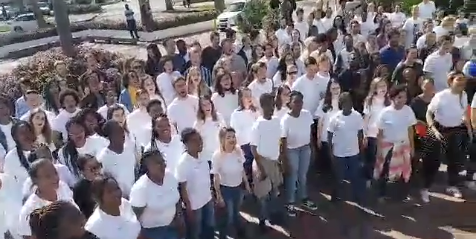 At this year's event, singers from the featured university choirs - the University of Johannesburg Choir, TUKS Camerata Choir, Stellenbosch University Choir and the NMMU Choir all gathered for an impromptu singing session outside of the event's venue. What followed was an uplifting performance that not only inspires but fills anyone who watches with joy. Take a moment to cast all of your troubles aside and witness the power of music.